I had a really cool morning at school making a comic strip for the ancient Olympics. I read loads of fact sheets and did you know in wrestling that you were not allowed to bite but you were allowed to break your opponent's fingers! We don't do wrestling in PE. I'm glad! I decided to try something new today and I chose the vegetable spring rolls from the menu. They came with sticky rice which was amazing because it stuck to itself but not to my fork. My soup today must be the best soup in the world. It was chicken noodle soup and the noodles melt in your mouth. My dad thought I was drinking coffee with my lunch but it was really chocolate milkshake. I don't think I will have spring rolls again but I will always have the soup! I am still not sure if I could have had fruit today because I had a starter. I will ask a teacher tomorrow. Today I have been sent lots of photos from America. This one was sent in by Kimberley who works in the Glenview school district, near Chicago, Illinois. Dad timed me to find Chicago on the globe and it took me 48 seconds but it was not fair as I was looking for it spelt SHicargo. I would have chosen Glenview food over mine today and eaten everything! I'm in the 11th grade and from Florida in the United States. Our school (which is from Kindergarten to 12th grade) serves pretty decent lunches! I usually just pack my own though. I love what you are doing and I think you should continue!! 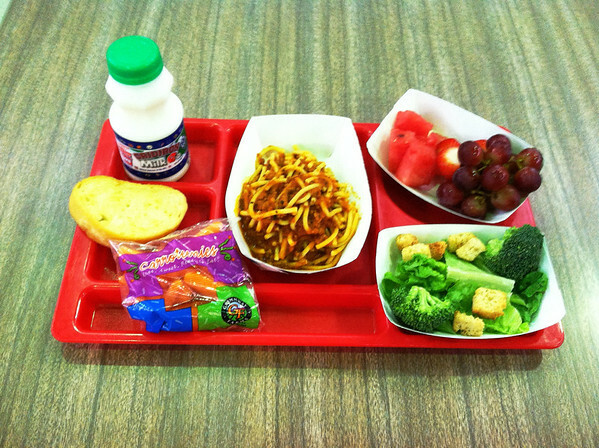 It's awesome that your blog is doing great things for your school lunch and students. Keep up the amazing work! It's a fantastic idea! Veg, For the second day in a row, this looks better than the lunches pictured in your earlier posts. Was there chicken or pork or something like that in the spring rolls? I am pleased to see the rice served along with sweetcorn, which boosts the protein content of this lunch. It's getting better, and I suspect your blog is the reason why. yeah I wouldn't say this looks particularly healthy.. spring rolls are processed and pre made, and then deep fried. The soup is probably packet soup, so high in sodium and low in nutrients. And that really just leaves rice and some corn, not really adequate. The school needs more focus on freshly prepared food and less focus on processed, pre made food that just needs to be heated up or reconstituted. Additionally, corn is a grain and not a vegetable. So this meal is again low in veggies. Well, then, I still hope this blog creates change, because some of the meals I've seen pictured here really don't look healthy, appetising or filling. Congratulations young lady! You are making history! Your parents must be so proud of you!!! I know I am! That soup does look good! I have seen your blog on several different sites(Yahoo and Gizmodo), and it is now bookmarked on my browser. I have really enjoyed reading your reviews. Please keep posting. I love your blog! Very interesting and it makes me want to eat more soup! (: Keep up the good work! I was so excited when I read Glenview! That's where I live and work! I started reading your blog last week when it was mentioned on a Cup of Jo. You are doing great! You are such an inspiration Veg, you are making a difference. By what I've been, reading adorable too. Love your blog! Hey Veg, you are really awesome. It's great that your proactive attitude made a real difference. Love me some veg, too. Keep up the great work! Good luck, and thank you~! Keep up the good work. Your AWESOME! Really enjoyed reading your blog! keep it up! I am so happy for you and for your school. What you have done is a good example of what your generation is capable of. Positive change on a large scale! May this always be in your mind as you continue to grow up! Take care and eat well! I just discovered your blog, and am fascinated. I would love to feature your blog there, if you are interested. We love to have young girls submit articles. Will follow your gastronomic adventures with interest. Your school food looks much better than any of the school food here in America. Lunch here is mostly packaged snacks and reheated processed food that is not filling or healthy for the kids. I really appreciate what you are doing here Martha, and I hope this food revolution reaches the United States. I myself am trying to pack my children healthy lunches, with balanced portions for growing kids. This looks better, at least more substantial. The tray from California looks more like what my kids got at their school. Have you noticed that you feel more satisfied after eating your lunch now that you can have unlimited veg and bread? Are you still super hungry when you get home from school? I hope your school changes its meals soon because what you get is not fit for humans, maybe chickens, but definitely not for humans. keep up the good work!!! I came across your blog yesterday and it's now linked on mine. What you're doing is so great. Your lunch today looks healthier, but it's still a puny amount of food. Keep it up! Omg did you actually eat those spring rolls? They'd have definitely been deep fried or microwaved (radiation), probably been frozen (they are certainly not freshly and individually rolled by the kitchen staff) and are full of MSG (neurological diseases) and trans fats. I mean if the school doesn't want to feed the students properly, ok but giving poison is a bit extreme... Good luck there in your school! Keep up the good work! The microwave radiation is only in the microwave oven. It's gone as soon as you turn it of and it's only effect on food is making the water particles move faster, i.e., increasing the food temperature. I recommend taking some science classes. Just wanted to say I love your blog and the interview. What a wonderful idea! I'm 44yrs old and grew up in Albuquerque, NM USA, but I remember having a lot of really sad and often unhealthy school lunches. I'm so glad you have supportive teachers (and a really great Dad! ), and also the drive to do something like this. Food can, and should be, both healthy and tasty every day. Thanks for making a difference, keep up the good work! Best, John D.
Wonderful blog, such a genius idea to capture the photos each day. Keep it going! Good for you! The POWER OF THE PEN strikes AGAIN!!!! I was very disappointed to see that your lunch for today contained no protein at all. I don't know how this can be allowed to happen. I wonder if the cook at your school knows anything at all about nutrition. Your blog can only help matters. Well done, Martha! I commend all you and your father have done. We have the same issues here in the United States, as you know by now, and I too have started sending lunch with my children. The items they served were full of fat and grease. It also cost more for sub-par food. Whoever is in charge of figuring out costs needs to be fired. I'm so glad Jamie Oliver got involved. I hoped he would make a difference here in the US but it didn't work. Keep it up! Only need 1 voice to start a revolution! What a fantastic job you are doing, well done! Altlhough the amount of food looks better, as well as the content, since you started blogging I'd be interested to know if you are still hungry after any of your lunches? This is a linq to my blog for Yesterdays food. Hi! I found your blog from a recent CNET post. I have to say, your English is most impressive! Great blog, too! You are doing such a great job, Martha! I lived in Scotland for a while, and though it is one of my favourite places in the world, there definitely needs to be more colours besides white and yellow on plates there. Well done on making a change! PS: You are coming up on a million page views very quickly. Congratulations! Wonderful blog! Those spring rolls don't look too tasty. The soup does look delish! Your blog is wonderful! 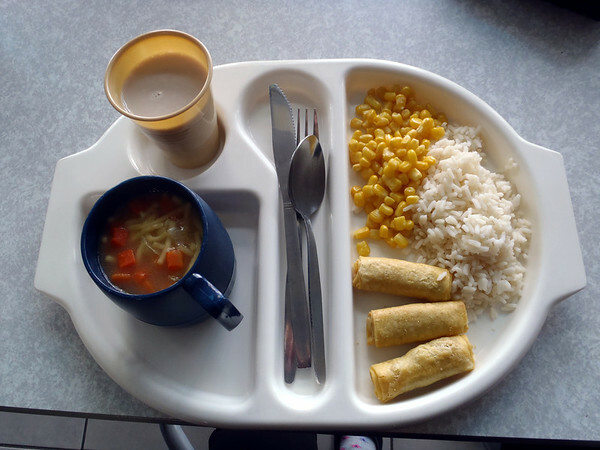 I wish I'd been able to do something like this back when I went to school here in America; our lunches looked like the first lunch you posted a picture of most every day, although it got a little bit better when I reached high school. My elementary school had some not-so-healthy choices back when I was a kid; I remember hating the school food, and I wasn't so health-conscious when I was little so I got peanut-butter and jelly sandwiches every day (there was no variety, the other option was chicken gravy, or pizza), and they made the sandwiches with THREE slices of bread. I love your blog and what you are doing to help kids who need better lunches everywhere! I am a primary school teacher from Chicago and I actually work very close to Glenview. Keep up the great work! Well done Martha for proving that the internet and more directly, blogging can be so powerful in changing things around you! And kudo's to you for proving to others your age that blogging is really cool and a good idea to do. You have single handedly proved that one voice can get things done no matter what your age is. Hi - still loving your blog. The food has certainly improved in quantity since you started blogging. The lamb meatball meal yesterday looked pretty good. Though how is your mash? I remember mash when I was in primary school being really lumpy and horrible. The trick with school meals isn't just to make them nutritious, they've got to be made with good quality ingredients and a good level of skill, too. The American meal was interesting because some of it looked good - especially the green raw veg salad - but it seems very American to add croutons (presumably fried) to that, and the fried-looking garlic bread on the side is probably not the healthiest either. And then there was that packet of raw carrots (? I think that's what they were ?). So crazy to buy in peeled, packaged raw carrot, rather than peel and chop it fresh, when it would taste so much better and not use wasteful packaging. Keep it up - fab work. Croutons are usually baked and I've never seen a fried Garlic bread in my life. But it's very much the "american" way to serve things pre-packaged like the carrots and the fruit snacks (in another photo). I won't disagree that it's wasteful. I am glad to see that there are so many fresh veggies on the American lunch and not frozen, canned or cooked within an inch of their lives. I'd love to see more of those fresh ingredients make it onto the school meal plates of every country! Hi Martha, I'm from the UK and I remember what my school dinners were like 15 years ago, when I see yours it looks like it's gone downhill! VEG, just started reading your blog, and I must say I enjoy it, your writing and anlysis, your very good pictures, and also the interest you take in good food. Hello Veg & Veg's Dad! I just read through your blog & I've found it fascinating as well as horrifying! Thank you for supporting your child in this. I think it's a wonderful way to bond with her while helping every family in the school. Keep up with this interesting bit of reporting! Well done, Veg! Those school meals are absolutely pitiful and do not look nutritionally balanced - they are certainly very carb heavy. Very little thought seems to go into those. you rock! keep up the good work! have your dad add a subscribe button to your page so we can follow you! Hey VEG, great blog! You've been mentioned on Spiegel Online (one of the largest german news sites)! Veg, I found out about your blog through a friend and I've just finished reading it from beginning to end. It's a very interesting read but it's so sad to think that so many children aren't getting a good enough dinner. I hope it helps to make schools think about what they serve to their pupils. Keep up the good work, sweetpea, you're a proper trooper! I'm really impressed with your writing & with the changes that YOU have made happen. Keep working hard - you'll change the world! Hey Veg! Congratulations on so many views! I'm nineteen now and your blog brings back so many memories. Your trays are exactly the same as the ones we had in school in Darlington UK, except in the cup holder we used to have these funny little blue cups! We got to choose between blackcurrant, orange juice or water. I pretty much always chose blackcurrant. The macaroni cheese will always be my favourite, I was poorly recently and when I was in hospital the food was rubbish, but I had macaroni every single day because you can't really go wrong with cheesey deliciousness. Another favourite was these gorgeous little roast potatos, they were bite size and SO delicious. Do they still have those? You are far more enterprising than I was at my age, and I hope you continue the great work. You can see now that good things can happen if you put some effort into getting what you want, and you deserve all of the praise and accolades you are receiving. You're about to hit a million views, so congratulations on that in advance! Are you planning a career in food journalism? I hope some American kids will be inspired by you to make a difference too. Gave you a plug on our organic farm's Facebook page. Stay with it...don't let them off the hook! I love your blog. Your pictures are great, and I enjoy those that you've posted from other places as well. Your writing is better than a great deal of other blogs I've read! Keep up the good work, smart girl! Veg - loving your blog. Keep up the good work, it seems to create change. Hopefully more schools will start to pay attention to what they are serving their student. I discovered your blog while reading a technology site. I'm a mum of four living in a small town in North Carolina. Your blog has inspired me to have my school kids take pics of their lunches. It has been several years since I've seen their school lunch and now I am curious. I know that they are always hungry when they get home so they must not be eating much at school. When I was in elementary school they set up a bar style system where the kids served themselves. There was tons of fruit and veg that we could help ourselves to. But it was a small country school, with Pre-K through 8th grade (American grades) all in the same building. When I changed schools, in middle and high school and in another state, the food went down fast. It was always burgers, frozen pizza, french fries, etc. In high school, I had one friend who would bring carrot sticks to lunch and that's all she would eat. Another would eat only french fries and cheese dip. Still another french fries and almost half a cup of ketchup (the processed kind with all the corn syrup.) For most of the school, the french fries and yeast roles were the primary feature of their lunches. There were salad options, but they were a meal to themselves- not a side dish, and it was just ice burg lettuce with some toppings. It definitely affects a students ability to focus and learn, to stay awake during class! You have a lot of brains and a lot of initiative, your blog is very inspiring. Keep up the good work! YOU ROCK, GIRL! See, one person can change the WORLD! You can be proud! Well done! Your idea to blog about school food is awesome. You have created a great example of how to start changing things. Please continue. My regards and best wishes! Greetings from the Commonwealth of Virginia, USA. Keep up your good work - it will make a difference, as you already have seen it. For you, your school mates and many others. hey, i also did find you over tastespotting and i really like your inspiration with this blog. keep on going! greetings from germany! I live in America and I would much rather have your lunches! Our food is like yours, but yours has a better quality. Our food may look good, but it really doesn't taste that good. I will give you a picture of the lunch at my middle school (It will be my first year) when school starts back. Good Job kiddo for standing up and saying we need better food for us kids. Hey Veg !! What an amazing Blog, congrats from Brazil !!!! I don't have pictures from school lunch here, but I'll try to find it to send to you. It is a really nice place to visit when you grow up!! I would love if Brazil Government could enjoy your blog... Your parents probably are the most proud ones in entire world ! Thanks for your really nice job !! My son is 10 years old and goes to public school in Illinois. The picture sent in from Glenview, IL looks tasty, fresh and healthy. However, this is not the type of lunches all American, or even Illinois, public schools serve. My son always brings his lunch and never eats the school lunch. The lunches at his school are similar in nutrition to yours with a lot of starchy and greasy foods and lots of pre-made items. Most vegetables they serve come out of a large industrial size can with most of the nutrients cooked out of them and most fruits are the kind that are packed in syrup with a high sugar content. They serve almost no fresh fruits/vegetables. Also, similar to your lunches, there are practically no whole grains. Mostly all of the grains/bread items have been reduced to simple carbs/starches. Luckily, like your family, we do not rely on the school lunches for his nutrition. We admire your determination and encourage you to keep at it. I'm seeing some of the lamest lunches on your blog. The good news is, if you post a pay-pal "donate button" to your blog you will make millions and be able to buy much better quality of lunches. Love the blog! Keep up the good work, I hope you'll continue to see changes in your school food program and encourage kids all around the world to take similar action in their community. Veg, you are awesome. Love how you created change by speaking out using your own words...and love to see the lunch posts from around the world. I have a question...are you a Girl Guide in Scotland? Want to share this site with Girl Scouts here. I go to school in Virginia and our food varies wildly from edible spaghetti to well, it looks like whole grain bread with 'cheese' on top. but i don't know what it is. I went to school in Virginia, but it was in the late 1990s (when you were born probably!) and I hate to say it sounds like things have not improved that much. Back then our options for "main dishes" were things like Nachos 'n' cheese, hamburger/cheeseburger, pizza, french fries, Hi'C, chocolate milk, and Captain Crunchee ice cream bars. Sometimes, we also had the spaghetti thing you mention, with a lot of some beefy tomato sauce thing on top. Fruits and vegetables were only options, and they were always served in this tiny plastic serving thingys and never an appropriate portion, in my opinion. The apples and bananas were the only decent looking fruit, and the small side salads often had terrible lettuce - the kind that is either white or brown on the corners. In high school, I started bringing my own lunch or stopping for a bagel at the shop across the street from school, because I played softball and tennis and was on the "It's Academic" team and I couldn't practice without the proper food! Veg, I love your blog! The lunch above at Glenview may not be typical in the U.S., but I think some places started changing after that documentary movie "Super Size Me" came out about ten years ago. Have you seen it? It's the one where he goes on an "all McDonald's" diet for thirty days, in order to show what eating fast food too often (or at all) can do to you. Your blog is great! I think it's really interesting that in today's post, the American meal has 5 different pieces of waste, whereas yours seem to be made up of washable/reusable components. Keep up the good work!